Pete Soukup, Greater American Ribs, Inc.
Pheasant Forever and Quail Forever's NO CHILD LEFT INDOORS® Initiative is part of a national movement to reach a generation of young people fixated on electronics and get them outdoors. We want to reverse the trend of inactivity and obesity in today’s youth and actively engage them in outdoor activities and in learning about nature and conservation. We also want to foster tomorrow’s leaders and conservation-minded citizens. Join Us for the Focus on Forever ConferenceFocus on Forever (FOF) is a “train the trainer” conference, designed specifically for conservation volunteers and agency staff who are passionate about sharing our outdoor traditions with youth and their families. 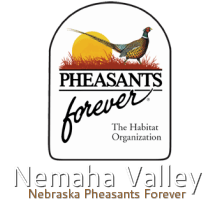 For more information visit thecriley@pheasantsforever.org.